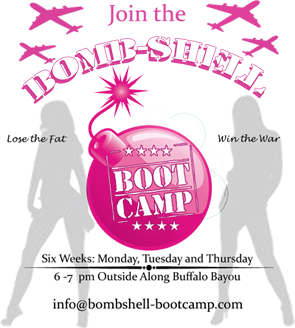 Bombshell Bootcamp was a sponsor of last weekend’s Going Pro Entertainment convention in Houston. Going Pro offers consulting and preparation for professional cheerleaders and those wanting to audition. They asked us for our top 10 fitness tips, so below is what we recommend for everyone – not just pro-cheerleaders! 10. Drink plenty of water. When you are hydrated you have more energy and eat less. 9. Carbs are not the enemy. Just stick to complex carbs and avoid white pasta, breads and processed carbs. 8. Put your workout time on your calendar, put a sticky note in your car or setup another reminder that you have an appointment with YOU. 7. If it comes in a bag or box, don’t eat it. 6. Eat every 3-4 hours. Three big meals a day will slow your metabolism. 5. If you eat healthy today and workout – reward yourself with something that isn’t food. A new song for your ipod, fitness magazine or a manicure are all good ones! 4. Set out your workout clothes and gym bag for tomorrow. If you have a cute outfit planned, you’ll want to wear it! 3. Don’t forget weight training. The more muscle mass you have (vs. fat) the higher your metabolism is. Mix in some weights before work, during your workout or before dinner. You won’t “bulk” up. Promise. 2. Eat breakfast within an hour of waking up. 1. Just do something to make you sweat. If you can get in a 30-60 minute workout – great! If not, jog some stairs at work for 10 minutes or take your dog for a brisk walk. Just break a sweat and get your heart rate up!